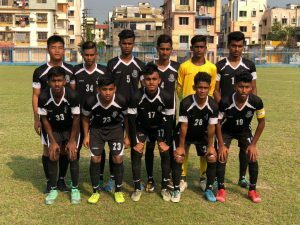 Home / Indian Football / I-League / Mohammedan Sporting U-15s edge United SC in five-goal thriller! Mohammedan Sporting Club returned to winning ways in Hero Junior League (U-15 Youth League) after beating United Sports Club 3-2 in a highly-entertaining clash at the Kalyani Stadium on Thursday afternoon. Nonetheless, Mohammedan Sporting’s blistering start was to pay dividends in the 19th minute when Arghya Sarkar’s excellent long pass sent William through on goal and he scored to give his side the lead. United SC, though, grafted their way back around the half hour mark through Surajit. The striker turned inside the box to slot past Mohammedan Sporting goalkeeper Afroz Ahmed in the 31st minute. Meanwhile, Mohammedan Sporting also gave a good account of themselves in the later stages of the half but United SC made sure they kept things tight and compact as the both teams went into the break locked at 1-1. Nonetheless, the parity was only restored only till the 72nd minute as the visitors piled pressure on the hosts and Aftab made it 3-2 to Mohammedan Sporting with a powerful first-time shot. United SC, meanwhile, kept on pushing for an unlikely equaliser, but with Mohammedan Sporting content to sit back and defend, it was always going to be a tough ask, though substitute Bishal Mondal did come close in the dying minutes, only for Afroz to block at his feet. Mohammedan Sporting, who now have 9 points from 4 matches, will face NBP Rainbow AC on April 17 at Gayeshpur Stadium. Previous VIDEO – 442oons: Tottenham Hotspur 1-0 Manchester City – Kane injury (Parody)! Next Hays & Manchester City renew partnership until 2023!